JACKSON, Miss. – Things are slow to change in this Old South bastion. The brass bird cage of an elevator in the Mississippi Capitol that Laurin Stennis used to ride as a 6-year-old coming to see her daddy was still operated by hand when she stepped into it one day in early January, a 46-year-old coming to shake things up. Or at least nudge things along. “Ground floor please, sir,” she said to the operator. But some things have changed. The lawmaker who greeted Stennis in the grand marbled lobby below was a black woman, something unheard of when Stennis’ father, John H. Stennis, was a member of the nearly all-white, all-male state Legislature and her grandfather John C. Stennis was a legendary champion of segregation in the U.S. Senate. It was the start of a new legislative session, and Sykes, a Democrat from Jackson, had once again introduced legislation to replace the Mississippi state flag – the last in the country that still incorporates the Confederate battle flag – with a design widely known as the “Stennis flag.” It features a big blue star on a white field, encircled by 19 smaller stars and flanked by red bands. It’s graphically pleasing and increasingly popular. If the Stennis flag eventually replaces the old banner – its supporters aren’t expecting much to happen this year, with state elections looming – the banner might help alter the view the world has of Mississippi, a state with a brutal history of Klan killings and racial oppression. It could alter the reputation of one of the state’s most famous political names as well. Stennis, an artist, didn’t set out to lead a campaign to change the flag. But she couldn’t bring herself to fly the one she calls “a blinking neon sign of negativity,” and she knew she had the eye – and the political pedigree – to offer a something better. Stennis is not the only descendant of white Jim Crow-era leaders working to break their forbears’ lingering grip on Southern mores, updating their family legacies along the way. In 2015, after a white supremacist killed nine black worshippers in a Charleston church, Paul Thurmond, the youngest son of the late former Dixiecrat Sen. Strom Thurmond, R-S.C., helped lead the drive to strip the Confederate symbol from South Carolina’s flag. Peggy Wallace Kennedy, 69, daughter of late Alabama Gov. George Wallace, doesn’t sugarcoat the actions of her father, who pledged “segregation forever” and blocked black students from entering the University of Alabama. Instead, she has countered his politics with her own, linking arms with Rep. John Lewis, D-Ga., to cross the Edmund Pettus Bridge in 2017, and walking the Rev. Martin Luther King Jr.’s funeral route with the civil rights leader’s daughter, Bernice King. “I’m just full of dread, to be honest,” she said as she mounted the steps of the Statehouse with uncomfortable shoes and two plastic plastic bags filled with Stennis flag lapel pins. It was Capital Day, a kickoff schmooze-fest of legislators and lobbyists. But Stennis hesitated as one lawmaker after another passed by unmolested. But the Democrat, who died in 1995, was also a staunch defender of segregation, one of the authors of the 1954 “Southern Manifesto,” a howl of protest against the Brown v. Board of Education school integration decision and an intellectual underpinning of the South’s yearslong “massive resistance” to integration. In 1983, Stennis was one of four Senate Democrats to vote against a national holiday to honor King’s birthday. Laurin Stennis took her politics more from her father, a Princeton grad who quoted philosopher Albert Camus and publicly broke with the elder Stennis on issues of race. She credits her father – who served 15 years in the state Legislature – with helping her grandfather evolve. The senator eventually supported the renewal of the Voting Rights Act in 1983. Stennis is proud of both men, but she wanted nothing to do with their line of work. She is more at ease in her downtown Jackson art studio, a converted garage where she makes woodcuts of possums and pelicans and other Southern iconography. She lives with an ancient black lab on a block lined with Craftsman houses – one of which belonged to Eudora Welty. Many of her neighbors have Stennis flag yard signs. It’s a common complaint. While many in a state where more than 58 percent of voters cast ballots for President Donald Trump embrace the banner, it’s hard to find it on any but state buildings around Jackson. The $107 million Mississippi Civil Rights Museum – a wrenching walk-through timeline of more than 580 lynchings, the killings of Emmett Till; Medgar Evers; Freedom Riders Michael Schwerner, James Chaney and Andrew Goodman; and dozens of others – opened last year with no flagpoles. After looking into vexillology – the study of flags – and a lot of erasing, Stennis settled on the circle-star design. The 20 stars represent Mississippi’s entry into the union as the 20th state; the blue star on the white background is an inversion of the white star on a blue field of “Bonnie Blue Flag,” which was waved when the state seceded. Stennis sent her design to Ted Kaye, the author of “Good Flag, Bad Flag” and a consultant on flag design around the world. He suggested making the stars a bit bigger, but he otherwise loved it. His cardinal flag principles include being simple, distinct and free of letters or seals (which become blurry at bumper-sticker scales). Stennis showed her design to friends, but not until the Charleston massacre reignited the flag debate did she debut it in earnest. Immediately, it began popping up in public, especially in Jackson, Oxford, beach towns and other liberal pockets of the state. A municipal judge put it up in his courtroom. But it appeared in some conservative quarters, too. The last big push to get rid of the current flag failed overwhelmingly in a 2001 referendum. The proposed replacement, featuring a round field of stars, was widely derided as the ”pizza flag,“ making it an easy victim of the protect-our-heritage arguments still heard today. 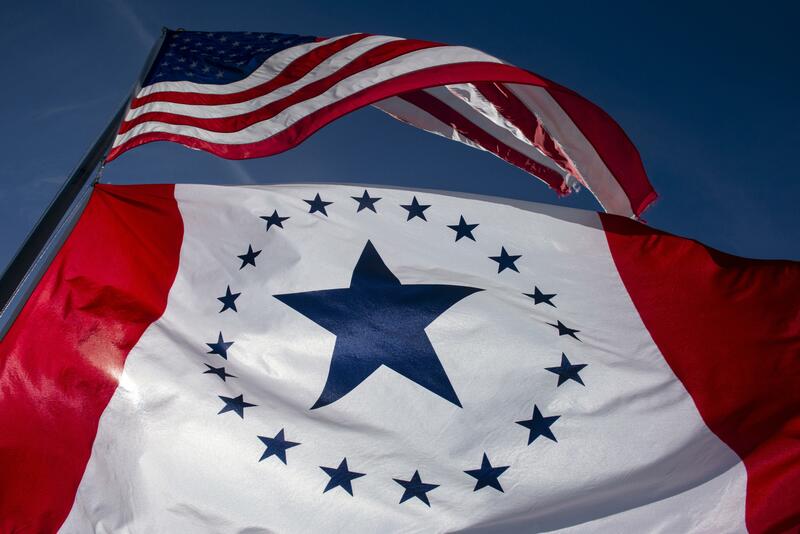 She wanted a local company to reap the financial gains of the growing demand, so she gave exclusive rights to sell the flag – along with all the profits – to A Complete Flag Source, a dealer off Interstate 55 filled with Ole Miss banners, POW flags and ensigns from around the world. It quickly became the company’s top online seller, with more than 2,700 flags, stickers and pins purchased. While she may hate the politicking, it found her easily at the Capitol. ”Thank you for what you’re doing,“ said a woman who spotted Stennis from afar and came over to ask for a sticker. ”Love the flag,“ called another. Under the soaring Rotunda, she ran into David Blount, a Democratic state senator who has co-sponsored Stennis flag bills, all of which failed to make it out committee. He expects the same result this session because it’s an election year in Mississippi. But as more people fly the Stennis flag, more lawmakers will notice, he said. ”You gotta keep at it,“ Blount said. At lunch two hours later, she got a chance to expand her groundswell. Bully’s Restaurant – where they serve fried chicken and greens on school lunch trays – is popular with Mississippians from all over the political spectrum, despite walls lined with photos of Malcom X and Barack Obama. ”What’re those?“ asked waitress Sandra Robinson, pointing at the flag pins and stickers. Stennis explained and gave her a bagful for the staff. A few minutes later, co-owner Greta Brown Bully was grilling Stennis about this new flag. ”Tyrone, we need a flagpole,“ she called to her husband in the kitchen. ”OK, we’ll get a flagpole,“ he answered, coming out. Soon, they were embracing, taking pictures and planning. Greta Bully promised to talk the flag up to the lawmakers who came in to eat. She booked Stennis to be on her weekend radio show to promote it.